An international customer needed a good looking and user friendly navigation solution for a large set of documents. Users search for documents related to the region and country they work in. So we created an easy and good looking navigation focused on the regions and countries. The navigation element is added to the 5 region views and on the country view, allowing the users to easily navigate between regions and countries. The user hovers over a regions and the related countries will be shown. The solution consists of two main parts, the country view with filter and the navigation element. First I will explain how the country view works, followed by the navigation element. The country view uses an query string (URL) filter that is added to the view page. This filter takes the value of the parameter Country out of the URL and filters the document based on this parameter. Add the Query String (URL) Filter to the page. 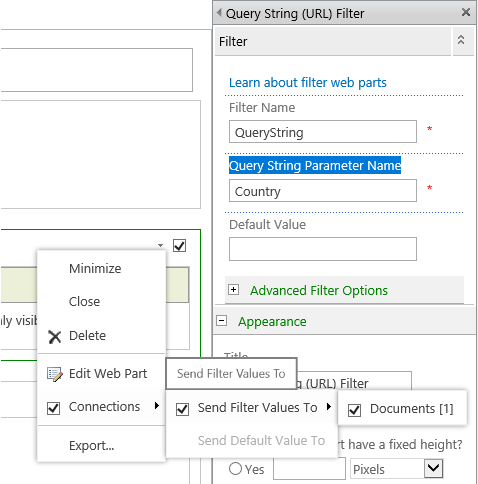 Set the Query String Parameter Name to Country. Configure the Web part connection to send filter values to the document library. Add a Content Editor Web Part to the country view page. The HTML page show the structure of the navigation, the pictures, links etc. The CSS file provided the looks. Only div’s with a region picture have the class top set. When the mouse enters the div, JS will add the class active to the div. When the mouse leaves the div, JS will remove the class active from to div. The dropdown (div with URLs) will be shown. The div is hidden by default. The overlay on the region div will be set to full. SharePoint has multiple ways to add pages. It can be done in the document library (pages) or through the settings drop-down menu. For most users these are not the most practical and easy. An easier and faster way is to simply add a hyperlink or button on a page for user to click on. My favorite method is to add a button on the page in SharePoint style. The hyperlink I am using is exactly the same as the hyperlink in the settings drop-down menu. 1. Edit the page where the button needs to be placed. 2. Add a Script Editor web part to the page. 3. Add the following code in the script editor.